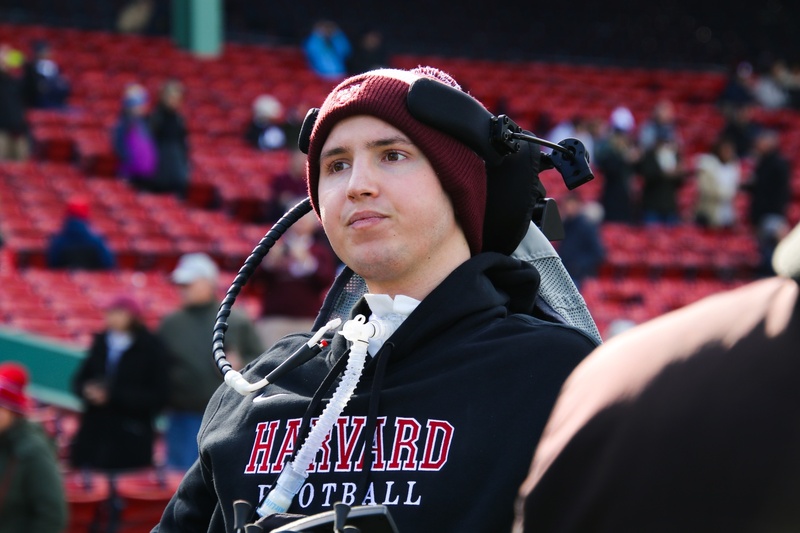 For the first time since the fall of 2017, Ben Abercrombie has returned to Harvard’s campus. 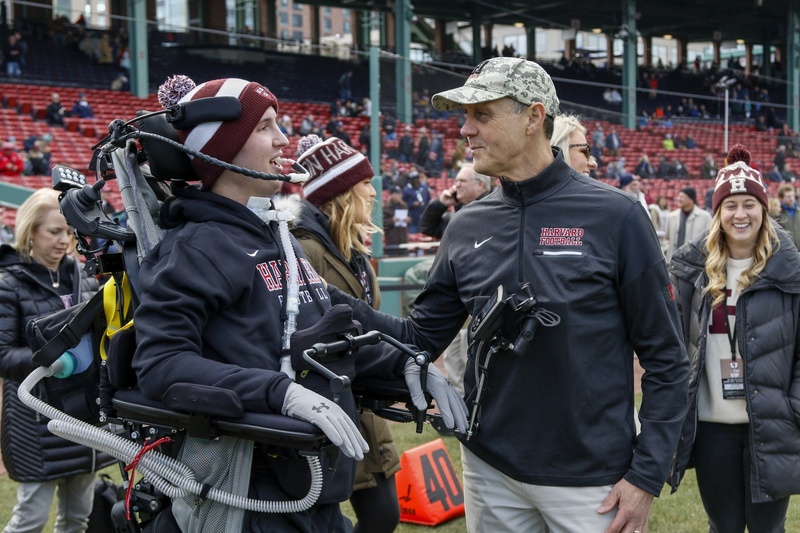 The defensive back, who suffered a career-ending injury in his first collegiate game, took in the 135th playing of The Game at Fenway Park, traveling with the help of the Harvard Varsity Club according to a post on his CaringBridge page from Nov. 11. 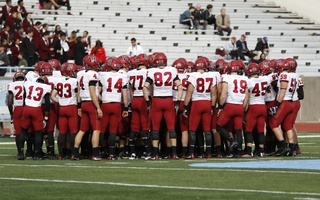 Arriving at a practice in the week leading up to the Harvard–Yale game, Abercrombie reconnected with teammates and coaches at his home field, Harvard Stadium. On Sept. 16, 2017, Abercrombie traveled to Kingston, R.I., for the team’s season-opening contest against the University of Rhode Island. He was the only freshman to make the travel roster. In the second quarter, Abercrombie made a hard tackle on Rhode Island’s Marven Beauvais near the Harvard sideline. Abercrombie laid motionless on the field — after a lengthy delay in a near-silent Meade Stadium, the defensive back was ultimately stretchered off the field and transported to Rhode Island Hospital. It was determined that he had fractured vertebrae in his neck, an injury which compressed his spinal cord and paralyzed him below the neck. After being released from the hospital, Abercrombie continued his recovery and rehabilitation at the Shepherd Center in Atlanta. On Jan. 8, 2018, Abercrombie returned home to Hoover, Ala.
Henze, who also grew up in Hoover, recalls playing youth football with Abercrombie and competing against him on a rival high school team. Currently, Abercrombie breathes with the assistance of a ventilator, though he has been working to wean off the device and breathe on his own. Signals from his brain are too weak to reach the rest of his body and produce unassisted movement, but he is able to perform rehab exercises with assistance. Teammates and coaches describe Abercrombie as a hard worker who gives 100 percent of his effort to anything he is doing and note that he has maintained that mentality during his rehab process. According to entries on his CaringBridge account, Abercrombie is planning to return to Harvard in the fall of 2019 to resume his education. Defensive back Ben Abercrombie suffered the injury on Saturday in a game at Rhode Island. 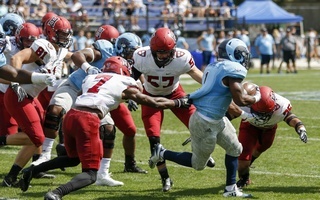 Ben Abercrombie, the freshman defensive back who sustained a major cervical injury in a football game at Rhode Island, has regained partial feeling on his arms and legs.